Looking to reward your employees, loyalty rewards recipients, and promotional partners with America’s leading consumer electronics brands? For more than 38 years, Crutchfield has offered a wide selection of high quality electronics for all of your home, car, and on the go needs. 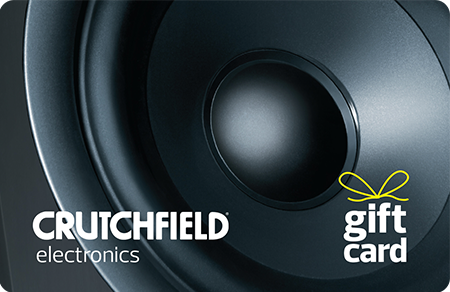 Your Crutchfield gift card recipients can gear up with car audio, iPods, tablets, TVs, cameras and more, by phone or internet, and standard shipping is free to all 50 U.S. states. Use Crutchfield gift cards for any kind of program! Why choose Crutchfield gift cards? Yes, volume discounts are available. $10, $25, $50, $75, $100 and $250. Cards can be loaded from $10-$500. Q. Can I order mixed denominations on my gift card order? Yes, your order can include any number of cards in any denomination you choose. You can pay by company check, wire transfer or ACH at time of order placement. Orders are shipped via FedEx and received within 3-5 business days of payment receipt. Burlington Gift Cards are shipped in bulk to a single location. No, gift cards are shipped inactive. A packaging slip is shipped with the cards which includes activation instructions. The gift card value is not printed on the cards. No, Burlington gift cards have no expiration dates. No, Burlington gift cards have no dormancy fees or other fees. No, Burlington gift cards can be redeemed for merchandise only unless required by law. Burlington gift cards can be used to purchase merchandise at all Burlington locations across the U.S. and online at www.BurlingtonStores.com. Q. Are lost gift cards replaced? Burlington gift cards are treated as cash. We are not responsible for lost or stolen cards.